Jeffrey L. Painter was appointed as a Commissioner of the Virginia Department of Alcoholic Beverage Control by Governor Terry McAuliffe in January 2014 and was designated as Chairman in April 2014. Mr. Painter has more than twenty years of senior executive leadership experience in the public and private sector, including prior service at the Virginia Department of Alcoholic Beverage Control as Legislative and Regulatory Coordinator and Chief Administrative Officer. During his prior ABC service, he oversaw the Hearings and Appeals and Public Affairs Divisions of the Department. His additional service includes Executive Director of the Virginia League of Conservation Voters and owner of Property Partners, a property management business operating and investing in vacation rental properties. Mr. Painter has served in many volunteer leadership capacities, including the Board of Fields United Methodist Church, the Fan District Civic Association Board of Directors, and the Toyota Urban Education Advisory Committee. A native of Page County, Virginia, Mr. Painter graduated from Emory and Henry College. Dan Noble was appointed Director of the Wyoming Department of Revenue by Governor Matt Mead in July of 2013. The Department is the primary tax collection agency for the State through its Sales, Mineral, and Property Tax Divisions. The Department, through its Liquor Division, is also the exclusive wholesaler of alcoholic beverages in the State and monitors alcohol control laws and licenses malt beverage wholesalers. Mr. Noble graduated from the University of Wyoming with a bachelor’s degree in accounting and served in the U.S. Army from 1974 -1981 as a surgical technician. Before entering government service, he worked in public accounting as a microcomputer consultant for three years and spent several years as the Chief Financial Officer of an ambulance company. Mr. Noble joined the Department of Revenue in 1998 as the Administrator of the Administrative Services Division and was subsequently appointed in March 2000, as the Administrator of the Excise Tax Division. Mr. Noble and his wife of 32 years, Shelly, live in Cheyenne and have two adult children, Jacob and Alicia. Mr. Sgueo is the President and CEO of the National Alcohol Beverage Control Association (NABCA), a national association representing jurisdictions that directly control the distribution and sale of beverage alcohol within their borders. A graduate of the University of Maryland with a Bachelor of Arts in History, Mr. Sgueo served 23 years with NABCA as Systems Analyst, Director of Statistical Operations, and Deputy Director, prior to taking the leadership role of the Association in January of 1993. Now in his 47th year with NABCA, Mr. Sgueo has dedicated his time toward establishing working relationships among all interested parties in the alcohol beverage community through committee work, meetings, conferences and other means. Mr. Sgueo’s broad knowledge of the control systems and the alcohol beverage industry is evident in the growth NABCA has experienced during his tenure. Mr. Anderson serves citizens of the Gem State in two roles. Governor C.L. “Butch” Otter appointed him as Director of the Idaho Lottery on January 9, 2007, and as Director of the Idaho State Liquor Division (ISLD) on April 30, 2010. He is a member of Governor Otter's Cabinet, a Past-President of the Multi-State Lottery Association (MUSL) Board of Directors, a Past-Chairman of the National Alcohol Beverage Control Association (NABCA) Board of Directors, and a Past-President of the North American Association of State and Provincial Lotteries (NASPL) Board of Directors. Mr. Anderson came to state service after twenty-six years in broadcasting, most recently as Vice President and General Manager of CBS television affiliates KBOI (Boise) and KIDK (Idaho Falls). While in local broadcasting, he was involved in a number of executive board-level posts for the Idaho State Broadcasters Association, including legislative liaison representing the industry’s interests to Congress and the Idaho Legislature. He was the 2001 recipient of the National Association of Broadcasters Service to America Award for Service to Children. Mr. Anderson received his Bachelor of Science, Business Administration degree from California State University, Chico. He is the father of four children, grandfather of four, and resides in Boise, Idaho with his wife of 35 years, Theresa Anderson. James "Jim" Canepa is Superintendent of the Division of Liquor Control. He joined the division in February 2017 to provide project leadership for the Liquor Modernization Project (LMP), the state’s effort to modernize systems and processes across the liquor enterprise. Under Canepa’s leadership, the division has replaced a 40-year-old inventory system with the Microsoft Dynamics AX system, added 17 new Liquor stores towards the goal of 20 by January 2019, reduced delisted inventory by 58% (75,418 bottles) since November 2017, and has started the process of enterprise-wide merchandise-category optimization with 125 of 465 Liquor stores scheduled to be re-set by October 2018. Prior to joining the division, Canepa served as Chief of Staff and Legal Affairs for the Ohio Environmental Protection Agency. In this role, he managed the Agency’s Legal Affairs, regulatory compliance and enforcement, and criminal investigation and enforcement. He has served in numerous leadership roles in Ohio state government, including Chief Legal Counsel with the Ohio Department of Public Safety, Deputy Inspector General with the Office of the Ohio Inspector General and First Assistant Attorney General for the Ohio Attorney General. In these roles, he was responsible for overseeing legal affairs, complex projects and process improvements. Canepa began his career with the Franklin County, Ohio, Prosecutor’s Office, where he served as an Appellate Prosecutor and a Senior Trial Prosecutor. In those roles, he defended felony convictions in the Tenth District Court of Appeals (Ohio) and the Ohio Supreme Court, and supervised and litigated felony criminals in trials in common pleas court, respectively. Throughout his career, Canepa has been recognized for his exemplary work and was honored with the Outstanding Advocacy award from the National Association of Government Attorneys, the Caulley Award for Outstanding Victims Service and a Resolution of Recognition from the Office of Governor George V. Voinovich. Canepa earned a Juris Doctor from Capital University Law School, and a bachelor of science degree in business administration from Bowling Green State University. Mr. Deloney was originally appointed as an Administrative Commissioner to the Michigan Liquor Control Commission (MLCC) on June 10, 2011 by Governor Rick Snyder for a four-year term and was re-appointed April 24, 2015 for a second four-term that expires on June 12, 2019. At the time of both of his appointments, Governor Snyder designated him Chairman of the Commission. In this role, he has been recognized in the Michigan Information and Research Service daily Michigan government and politics news as one of the most effective officials in the Snyder Administration. Prior to his time at the MLCC, Mr. Deloney served as Vice President of Public Affairs for the Michigan Restaurant Association (MRA). In that role, he oversaw the legislative, regulatory, and political operations of a trade association widely and consistently considered to be one of the most powerful and influential in Lansing. In addition to the MRA earning plaudits under his leadership, Mr. Deloney was voted numerous times by Lansing insiders to be one of Lansing’s top individual lobbyists. Before his time at the MRA, he was the assistant state director for Michigan’s arm of the National Federal of Independent Business, an advocacy organization for small and independent business owners. Mr. Deloney also previously served as a legislative assistant in the Michigan House of Representatives, performing policy duties for two state representatives. Mr. Deloney earned a bachelor’s degree in political science with a concentration in public service from Albion College in Albion, Michigan. Mr. Deloney resides in White Lake in the Detroit area with his wife, Tammy, and daughters, Audrey and Abigail. Bob spent 15 years with Marriott International in a number of capacities, from 1981 to 1995. Mr. Dorfman joined Marriott as Vice President of Procurement and then ran a number of Marriott contract service businesses. Mr. Dorfman was the President of Host International and a corporate officer of Marriott for 10 years. After leaving Marriott, he consulted with a number of smaller and mid-size companies, helping them to develop their business strategies and assisted in creating their operating infrastructure to grow, substantially increasing their market value. Mr. Dorfman joined the Five Guys franchise system in 2005, purchasing a 16 store territory in Tampa, FL. Mr. Dorfman subsequently purchased the rights for Columbus, Ohio, where he opened 11 stores, then Houston Texas, opening 13 stores and South Texas with two stores. His company, TCH Restaurant Group, had a total commitment to open 103 Five Guys. The company was sold to Five Guys corporate in November 2012. In June of 2012, he joined Trusthouse Services Group as President and COO. In May of 2013, the company was successfully sold to a major French company. In October of 2013, Mr. Dorfman signed a development agreement with World of Beer to open several locations in northern and central Virginia. Mr. Dorfman owned and operated successful locations in Charlottesville, VA and Ashburn, VA, before selling both locations in December, 2016. Mr. Dorfman received his BA in Political Science from Rutgers University and his MBA in Executive Management and Marketing from St. Johns University in NY. In January 2017, Mr. Dorfman was appointed Director of the Montgomery County, MD Department of Liquor Control. Mr. Dorfman and his wife, Marlene, live in N. Potomac, Maryland. Mr. Frierson was appointed Commissioner of Revenue by Governor Phil Bryant and took office July 1, 2016 and is currently serving a six year term. Mr. Frierson served twenty-five years in the Mississippi House of Representatives, the last five as Appropriations Chairman. Commissioner Frierson has twenty-four years of experience in real estate with twenty years specializing in real estate appraisal. Prior to serving in public office and real estate business, he was a public school teacher/coach with a Bachelor of Science degree in Education. Mr. Frierson is married and has two children. Mr. Gipson is serving his second term (7th year) as the administrator of the Alabama Alcoholic Beverage Control Board. As administrator, Mr. Gipson oversees more than 800 employees, who work in the central office and warehouse, and 176 retail and wholesale stores statewide. Prior to his appointment, Mr. Gipson served four terms in the Alabama House of Representatives, representing Autauga and Elmore counties. During his legislative service, he was a member of the Travel and Tourism Committee and was instrumental in crafting the state education budget as a member of the House Education Appropriations Committee. A United States Army veteran, Gipson is the retired CEO of Gipson’s Auto Tire in Prattville and Millbrook. Mr. Gipson is a member of American Legion Post 122, and a member of the Prattville YMCA Board of Management. Mr. Gipson ºis married to Brenda Dumas Gipson and together they have six children, Hannibal (Hoot) M. Gipson, III, Meg Gipson Lowry, Bob Gipson, Jo Ella Gipson McIntosh, the Honorable W. Ross Ashley III and Lt. Col. (Ret.) John R. Ashley. A. D. "Zander" Guy, Jr.
A.D. "Zander" Guy, Jr. was appointed by Governor Roy Cooper to serve as Chairman of the NC ABC Commission in March 2017. Chairman Guy previously had served on the NC ABC Commission from 2009 to 2013 and was Chairman from February 2012 to February 2013. Chairman Guy is a native North Carolinian who has always lived and worked in the southeastern part of the state. Chairman Guy attended Campbell University and is a graduate of the Realtors Institute. For more than 25 years he held elected office in municipal government. Chairman Guy is the former Mayor of the Town of Surf City and is a member of the Cape Fear Community College Board of Trustees. 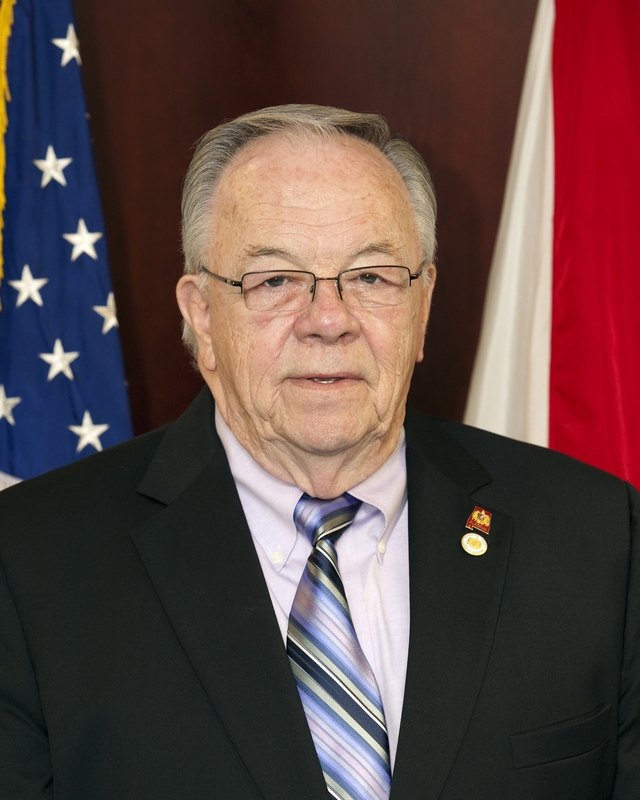 He is past President of the Neuse River Council of Governments, past member of the Local Government Advocacy Council, and former Mayor and Councilman of the City of Jacksonville. He served on the North Carolina Banking Commission under Governors Hunt, Martin, Easley and Perdue. In 2011, he sold his real estate company and retired after 41 years in the business. Chairman Guy is married to Sabrina M. Guy. They have three children and four grandchildren. Tim Holden was first nominated to the Pennsylvania Liquor Control Board by Governor Tom Corbett on June 14, 2013 and was unanimously confirmed by the state Senate on Nov. 13, 2013. Mr. Holden was named chairman of the PLCB by Governor Tom Wolf on Feb. 17, 2015. Mr. Holden was nominated to a second term by Governor Wolf on May 18, 2016 and was unanimously confirmed by the state Senate on June 29, 2016. Mr. Holden is a native of St. Clair, Schuylkill County. After attending St. Mary’s Elementary School and St. Clair Area High School, Mr. Holden received an athletic scholarship to Fork Union Military Academy, completing one year of college prep. Mr. Holden earned a football scholarship to the University of Richmond, but an illness cut short his football career. Mr. Holden completed his education at Bloomsburg University, receiving a Bachelor of Arts degree in sociology. In 1980, he earned his license as an insurance broker and real estate agent. Mr. Holden went on to work as a probation officer, was sergeant-at-arms for the Pennsylvania House of Representatives and served as sheriff of Schuylkill County from 1985 to 1992. Mr. Holden was a member of Congress for 10 terms, representing the Sixth District from 1993 to 2002 and the 17th District from 2003 to 2012. The Sixth District was comprised of Schuylkill and Berks counties, as well as part of Northumberland and Montgomery counties. The 17th District was comprised of Schuylkill, Dauphin, and Lebanon counties, as well as parts of Perry and Berks counties. Mr. Holden was a member of the House Agriculture Committee since 1993 and served as vice chairman of that committee in the 110th and 111th Congresses. Mr. Holden was named chairman of the committee’s Subcommittee on Conservation, Credit, Energy and Research during the 110th and 111th Congresses, and he served on the Livestock, Dairy and Poultry subcommittee. In the 105th Congress, Mr. Holden was appointed to the Transportation and Infrastructure committee. Mr. Holden and his wife, Gwen, live in St. Clair. Mr. Larson was appointed Administrator of the Iowa Alcoholic Beverages Division in 2010, and in 2014 was reappointed by Governor Terry E. Branstad. His public service career began in 1984, and his areas of expertise relate to regulatory compliance, financial management, and governmental relations. During his tenure at the Alcoholic Beverages Division, initiatives have been implemented to refresh and reform policies and procedures that have improved licensing, customer service, educational programs, as well as the revitalization and renewal of the alcohol regulatory compliance program. Mr. Larson has improved the agency’s relationships with state and local trade associations, industry partners and public officials. Mr. Larson is a Past Chairman of the National Alcohol Beverage Control Association, serving from 2015-2016, and is also a member of the National Conference of State Liquor Administrators (NCSLA). Mr. Larson graduated with honors from William Penn University in Oskaloosa, Iowa, with a Bachelor of Arts in Business Administration. Mr. Larson resides in Polk City, Iowa with his wife Jane, has two sons, and is a proud grandparent of two granddaughters. Mr. Manahan hails from a family rich with a history of community service. Currently, Mr. Manahan serves as the Director of Operations and Business Development for the City of St. Albans City. Over the last several years he has been deeply involved in the revitalization of downtown St. Albans including a 4 million-dollar streetscape redevelopment, the development of a 5 deck parking garage which services a newly built 84 room Downtown Hampton Inn, and a 40,000 square foot State of Vermont office building. Mr. Manahan has served on the St. Albans City Zoning Board; the Development Review Board; President of the City Council and Mayor of the City of St. Albans for three terms. Mr. Manahan also serves on the Northwest Regional Planning Board, the St. Albans City Downtown Board, Board of Civil Authority and Justice of the Peace. Over the years Mr. Manahan has also served his local community in a number other of capacities, including youth baseball, football and hockey coach, he has received a number of civic involvement awards and recognition, including the Timothy Bovat Community Service award. Mr. Manahan lives in St. Albans City with his wife Lisa and four children. Mr. Manahan enjoys spending time hunting the beautiful woods of Vermont or spending time at their camp on Lake Champlain. Mr. Mineo was appointed as Director of the Bureau of Alcoholic Beverages and Lottery Operations for Maine in May of 2014, having come off of a thirty-one career in the wine and spirits industries, where he served in many marketing and sales capacities during his tenure with the Seagram Company and the Absolut Spirits Company. Mr. Mineo has brought his extensive experience in the spirits industry to the State of Maine, and utilized it with the new business model the Bureau employs to take its spirits products to market. He has been integral in the implementation and strategic processes of the new “go to market” plank, which has transformed the business in Maine. After transitioning out of the supplier side of the spirits business, Mr. Mineo founded Beviamo Consulting LLC in 2009, dedicated to working with small developing companies in the beverage alcohol industry, specializing in strategic planning and business modeling. This brief period as an industry consultant resulted in adding value to several companies who were expanding their scope of work opportunities with their customers. In addition, he has spent some time with wine brokerage, representing suppliers and importers who marketed wines from Chile, South Africa and France. While the spirits and wine have been his vocation, his passion for the business comes through in his dedication to logistics and planning. His background in meeting and event planning for more than twenty years has elevated Mr. Mineo to the status of an expert, with an eye toward detail and customer satisfaction. Mr. Mineo’s educational background includes a degree in psychology from Bethany College and graduate work in economics and accounting. He is a member of several professional organizations, including NCSLA, The Center for Alcohol Policy, SCORE, International Beverage Network and others. Mr. Mineo lives in Portland, Maine with his wife of forty-one years, and they have two sons, Justin and Bryan. Mr. Mollica was first appointed to the New Hampshire Liquor Commission (NHLC) in January of 2010 and has served as Chairman since 2011. During his tenure, Chairman Mollica has overseen a consistent growth in sales and transformation of the state’s NH Liquor & Wine Outlet stores into a nationally recognized brand through a combination of extensive store renovations and relocations, investments in customer service training, warehousing and information technology, and by strengthening relationships with brokers, suppliers and licensees. Since assuming the Chairmanship, NHLC has received numerous accolades, including being named by the Washington Post as the “Best State in the Country for Wine Drinkers,” the “Third best state for buying bourbon” by BreakingBourbon.com and “One of the best places in the country to find rare spirits” by Serious Eats. In 2014, the New Hampshire Winery Association recognized Chairman Mollica as “retailer of the year” for his support of New Hampshire’s emerging winemaking industry which experienced a 76% increase in sales since he assumed leadership. In 2015 and 2016, StateWays Magazine awarded NHLC Control State Best Practice Awards for its first-of-its-kind web-ordering app and best warehouse innovation. In 2017, StateWays recognized the “Granite State’s Greatness” by naming New Hampshire the nation’s top control state. Prior to his appointment, Chairman Mollica’s background included extensive restaurant ownership experience, successful partnerships with state and local government agencies, and over 25 years as a self-employed entrepreneur. Chairman Mollica holds a Bachelor of Science in Culinary Arts and Food Service Management from Johnson & Wales University, Providence, RI. Chairman Mollica resides with his wife Allison in East Concord, NH. Mr. Petilos is a graduate of Rutgers College, Rutgers University. Mr. Petilos studied law at Fordham University School of Law and was engaged in the general practice of law prior to his relocation to Utah. Mr. Petilos began his career with the State of Utah as a member of the Office of the Legislative Auditor General. Mr. Petilos then joined the Utah Department of Administrative Services Internal Audit Team. Mr. Petilos served as Deputy Director of the Department of Administrative Services prior to being appointed Interim Director of DABC in June 2012 and confirmed as Director in September 2012. Mr. Petilos was reappointed and confirmed for a second term as DABC Director in November 2016. Paul Rosenbaum became Chairman of the Oregon Liquor Control Commission following Oregon Senate confirmation on September 19, 2017. Mr. Rosenbaum is currently Chief Executive Officer of SWR Corporation and previously served as Chairman of the Board and CEO for Rentrak Corporation as well as Chief partner at Rosenbaum Law Center. He served as a Representative in the Michigan Legislature from 1972-1978, during which time he chaired the House Judiciary Committee and was legal counsel to the Speaker of the House. Under Governor Kulongoski, he was one of nine members on the Board of Commissioners for the Port of Portland, during which he was Vice Chair for four years. Mr. Rosenbaum currently serves on the board for the De Paul Treatment center, Oregon’s largest treatment center for drug and alcohol abuse, is on the Providence Heart & Vascular Institute Foundation Advisory Council, and is the Immediate Past President of Providence St Vincent Medical Foundation Council of Trustees. Mrs. Schlauch became the Administrator of the Department of Revenue’s Liquor Control Division in July of 2017 and is brand new to the liquor industry. Mrs. Schlauch holds a Bachelor of Science in Business Administration as well as an MBA from the University of Montana. Prior to becoming the Liquor Control Division Administrator, Mrs. Schlauch was the Administrator for the Business and Financial Services Division for the Montana Department of Public Health and Human Services (DPHHS). While at DPHHS she earned a Governor’s Award for her role in Medicaid expansion that provided health insurance to an additional 70,000 Montanans. Mrs. Schlauch came to state service after almost 15 years of newspaper finance work where she earned a Lee Enterprises President’s Award. Mrs. Schlauch and her husband, Pat, have six children and four grandchildren. Fred Wooton has been with the West Virginia Alcohol Beverage Control Administration (WV ABCA) for over twenty-five years and was appointed Commissioner in January 2017. Mr. Wooton began his career with the ABC as an Inspector before being promoted to an Enforcement Agent and later to Enforcement Supervisor. Mr. Wooton has instructed officers and cadets at the West Virginia State Police Academy on Alcohol Beverage Control laws, rules and regulations since 2004, and for a number of years has served on the Policies and Procedures Executive Committee at Alcohol Beverage Control. Prior to joining the WV ABCA, Mr. Wooton worked approximately twelve years in the Lodging/Food and Beverage industry in southern West Virginia. Mr. Wooton is a 1984 graduate of the West Virginia University College of Business and Economics with a Bachelor of Science in Business Administration. Mr. Wooton resides in Beckley with his wife, Debra.